"I don't see you're going to see a shutdown," Trump said. "I don't think it's going to happen. We don't want to see a shutdown." 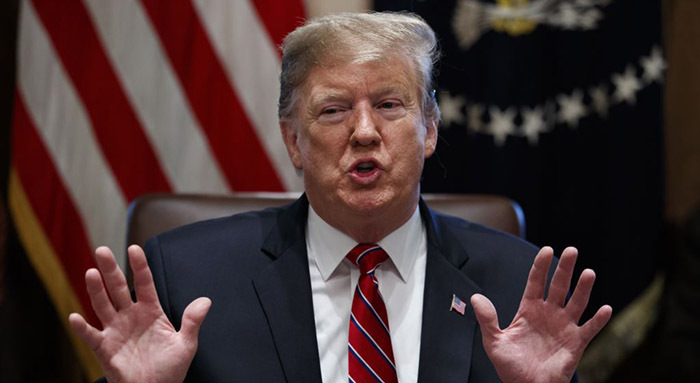 He signaled that he is looking for other government funds to expand wall construction without congressional authorization, a tactic that would draw legal challenges from opposition Democrats. "We're doing a lot of wall right now," he said, referring to barriers under repair or being built. Trump said he is reviewing the deal the bipartisan panel of lawmakers reached late Monday before taking further action. The agreement was reached about the same time as Trump took the stage at the border in El Paso, Texas, for a political rally calling for a wall. "We probably have some good news, but who knows," he said. "We need the wall and it has to be built and we want to build it fast." The congressional agreement would -- if Congress approves it and Trump signs the legislation -- end the immediate threat of another government shutdown. New barriers would be built in the Rio Grande Valley in southern Texas. Senate Democratic leader Chuck Schumer told the Senate, "I strongly urge the president to sign this agreement. No one gets everything they want in these agreements. But the president must sign it and not, not, not cause another shutdown." One Trump supporter, Republican Senator Lindsey Graham, said he did not see how Trump could support the compromise because it would cut thousands of beds available for undocumented immigrants at detention centers. "I don't see how that's a good deal," Graham said. Sen. Chris Murphy, a Connecticut Democrat, told VOA "the broad parameters (of the agreement) look like something Republicans and Democrats should be able to live with." But another Democrat, Sen. Chris Van Hollen of Maryland, warned that if Trump signs the legislation and then attempts to divert other funding to build the wall "that would be a gross abuse of the process and very possibly unlawful." One Trump political supporter, conservative television commentator Sean Hannity, called the deal a "garbage compromise." Congressman Mark Meadows of North Carolina, another wall advocate, said the agreement "is hardly a serious attempt to secure our border or stop the flow of illegal immigration. It kicks the can down the road yet again, failing to address the critical priorities outlined by Border Patrol Chiefs. Congress is not doing its job."